Becoming Nomads: Days 31 - A Full Month on the Road - Nine More to Go!!! Days 31 - A Full Month on the Road - Nine More to Go!!! Today marks our first full month in the campervan. It’s been ten weeks since we left Anchorage. So far we have traveled through nine states – Alaska, Washington, Oregon, California, Nevada, Utah, Arizona, Colorado, and New Mexico. We’ve put on a bit better than 3,000 miles on the RV. We have visited better than two dozen state and national parks and monuments. We’re on budget. We have seen some pretty amazing things and we are just getting started. 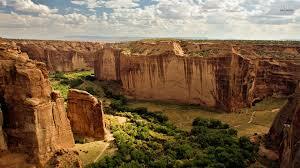 Today was a driving day with hopes of reaching Canyon de Chelly in Arizona by evening. It was slow going over narrow gravel and country roads. We traveled through high desert and Navaho Tribal Land for most of the day and then only realized after six hours into the day that we had made a wrong turn and were literally 30 miles from where we started in the morning. We had made a huge circle and were headed for Gallup. So we regrouped and came up with an alternative plan. We ended up in Gallup at a rather upscale RV park with all the bells and whistles…except for a relatable Wi-Fi signal. 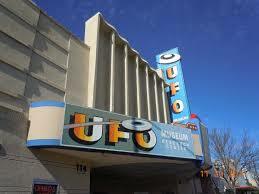 We will be here for four nights now planning a few long day trips in three different directions. Heading back north and then west through Widow Rock (Tribal Headquaters) we were then directed due north to the park. The park is at the city limits to the town of Chinle, AZ. 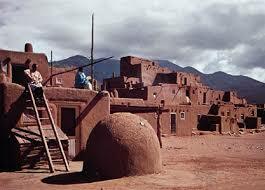 Chinle is a typical native town with lots of large public buildings and a grand school. Lots of low income housing units are scattered and there are a few service stores and gas stations. The park headquarters was small and as usual, well equipped with movie, displays, and good maps. We headed out on the north road to the first overlook. The canyon was indeed beautiful with 1,000’ high shear cliff sides and a grassy floor full of native farms. The colors were impressive. There were a few pueblo ruins to see as well as come really amazing rock formations. We spent the next two hours enjoying the views from several parking areas where a short walk took us to the canyon’s edge. We had lunch at the picnic area near the historic trading post. The shop was well done and well-appointed with some really beautiful pieces handmade and authenticated. Bobbie successfully purchased a beautiful ring for me and was able to keep it a secret for a few days. We took a slightly different drive back. It was a long day with five hours of roundtrip driving and visiting the park as well as a few native sites and shops. Another long day-drive to Winslow, AZ. It took us 2 ½ hours from Gallup to get to the crater. From a distance it simply looked like a small mound in the desert. As we got closer we could see that it was a crater and from the top it was really quite interesting. The center is run by an Indian corporation instead of the national park system. Interesting. From there we drove into Winslow for the ubiquitous photo “standing on the corner.” A sweet western town, Winslow’s downtown area seemed to entirely be dependent on the song. Several gift shops lined the main street and people were all over taking photos and buying t-shirts. The pueblo was only 30 minutes south so we decided to include it in our “day in Gallup” itinerary. The village was pretty sad…old adobe styled public housing surrounded by a lot of dilapidated mobile homes and a lot of closed up shops. The number of indian jewelry stores was overwhelming. The museum was closed as was the mission. We drove around the village a bit admiring all of the adobe bread ovens and then headed back to Gallup. Downtown Gallup was similar, although in much better shape. Curios and gift shop after shop lined the main streets. 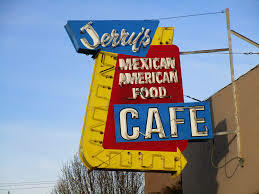 There was little to remind one of the “old west.” The highlight of the day was an amazing Nex Mex lunch at the famous Jerry’s Café. Tasty, hearty, full plates make for big smiles and full tummies. Long drive, our longest yet, all 450 miles of it to the southeastern part of the state. We traveled through many small farming towns, lots of hay fields, and the occasional pecan orchard. Where ever the water is hiding, they did a good job of finding it! Lots of natural gas and oil wells too. Carlsbad is a big town, aobut 60,000 people so there was sure to be a Walmart, Home Depot, and Safeway. We found a nice RV park on the south end of town and settled in for two nights. It had been 25 years since I was here and a first time for Bobbie. We drove the short distance from town to the national park and then into the visitor’s center. 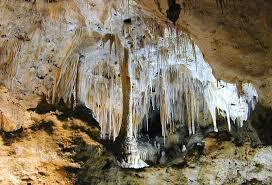 There we arranged our tickets for the tours and headed off to the natural entrance of the cave. It was a long, steep downward trail into the cavern. 900 feet below the surface the light disappeared and the walkway lights, as dimly lit as they were, created an eerie yet spectacular mood to the magnificent formations. It was cold, all of 56 in the cavern, and we were glad to have taken jackets. We had lunch in the great room before touring the other half of the cave. You’d think as a captive audience, we would have been charged a huge amount for a chef’s salad and sandwich. Surprise, surprise...with drinks only $12 for the two of us. 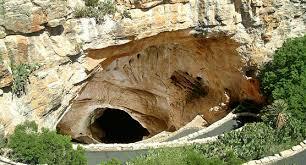 We were not able to book spelunking tours online and by the time we got to the park all had been sold out. There were openings for the next day but that was not in our plans. We headed back to camp in the early afternoon and enjoyed a lazy day doing nothing. 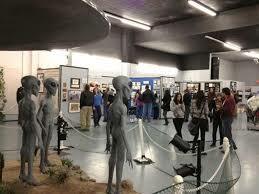 We left Carlsbad early and heading back north through Roswell for a stop at the famous UFO museum. It was a fun experience, well done with lots of documentation and reading, photos, newspaper articles, a long movie, and an kitschy gift shop. It was a fun thing to say we had done and we got some great photos. Afterward we stopped at the local Hobby Lobby store to get some craft supplies. Gotta keep busy on those down days when idle hands need to be kept active. A few hours later we were in the town of Ft. Sumner and looking for a campground for the night. The lake was a short drive from town and offered a great spot with wonderful views of the water. The $10 per night camp fee was a nice change too. This morning before returning to Albuquerque we visiting the Ft. Sumner memorial. 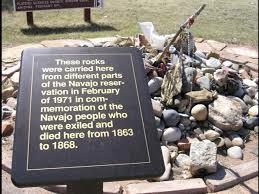 What a nice museum and display to remember the atrocities committed by the US Army against the Navajo and Apache Indians. We spent a few hours at the site before heading to Albuquerque. We arrived late afternoon and settled into a local RV park for the next four days. Tomorrow we hook up with my sister Tanya and her husband for a few special days.